Experience after previous Comics & Medicine conferences has taught me that if I start writing about it, I'll never shut up. It works better to do a photo essay and let the pictures do my talking. Suffice it to say that I returned home from this year's Baltimore conference more excited about the field and the people involved in it than ever. Graphic Medicine puzzles people ("healthcare and . . . comics?!") and they usually need to see a few examples before they get it. Mom's Cancer is one example, but only one; the reasons people do graphic medicine include storytelling, memoir, therapy, education, and public health. Some still don't get it, but many are quickly converted. As I've often said, one of the things I like best is gathering doctors, nurses, professors, students, writers and cartoonists--groups you might not expect to have much in common--to talk about interesting ideas and projects as equals. It's very cool. My midnight flight from San Francisco to Baltimore was an adventure. A two-hour fog delay at SFO made me miss my connecting plane in Chicago. The airline was great about getting me on the next flight, but by the time I arrived I'd been sitting on aircraft or in airports for about 12 hours. Then I had to get to a reception and help open the conference as the last of eight 5-minute "lightning" speakers. Approaching Baltimore, which is somewhere on the horizon there. As a Californian used to ocher-brown hills, I was impressed by the lush summertime greenness. Johns Hopkins Medical School hosted the conference in this building, which was less imposing in person than it may look in this photo. Not actually an impregnable brick fortress. The building had three large auditoriums plus a smaller classroom and cafe we used. Out back was an outdoor courtyard for breaks and lunch. Good space. My lightning talk was on "Practicing Graphic Medicine," which I've been doing since I first put Mom's Cancer online 10 years ago. I hoped to provide some context for the conference: before I started the webcomic, only a few people knew my family's story, which wasn't really a story at all because nobody was telling it. I put Mom's Cancer on the Web, and that expanded the story's reach. It was published as a book, which further expanded its reach. In 2010, I was asked to speak at the first Graphic Medicine conference in London, followed by more conferences. I think Graphic Medicine embraces all means of storytelling: oral, web, print; intimate and immediate in the case of the Web, distant and permanent in the case of print. Now it's a Graphic Medicine community. It's a niche field with enormous potential, and it makes a real difference in people's lives. 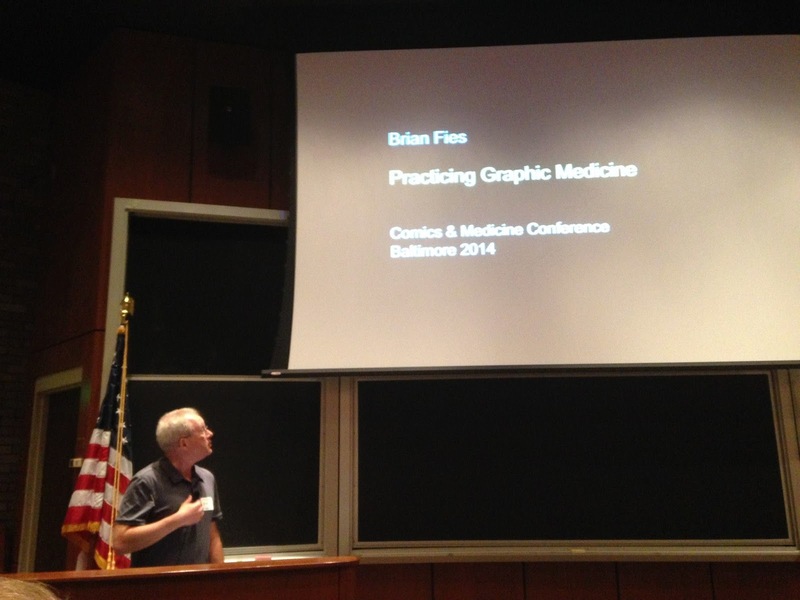 My pal "Comic Nurse" MK Czerwiec took this photo of the start of my talk. Audience for the opening night intro and lightning talks. About 200-230 people came to the conference, which I think is more than ever. That's MK in the blue shirt up front, sitting next to San Francisco State University professor Courtney Donovan in yellow. After the opening hullabaloo, some of us met for dinner at a terrific Afghan restaurant in Baltimore's historic Mount Vernon district, where most of us stayed. Good food and company, but you can imagine how fresh and witty I felt after coming in on the red-eye and being shot out of a magnetic rail-gun to give a 5-minute hyperspeed lecture. I didn't take many photos the next day because I kept pretty busy. I gave a 90-minute workshop titled "See One, Do One, Teach One," which applied that old medical school mantra to cartooning. I thought a conference dedicated to comics needed a place where you'd actually learn to make one. The idea was to take people who'd maybe never done so--maybe never even drawn since they put down crayons in the fourth grade--and send them into the world with the knowledge and confidence to not only create their own comics but teach others to create theirs. If not for MK Czerwiec, I'd have no proof I accomplished anything in Baltimore at all. Thanks again for the photo, MK! Me and my workshop. This room was set up a bit oddly, with the computer and projector in the center so I had my back to about a quarter of the participants. Nobody seemed to mind. Although all speakers' PowerPoint presentations were pre-loaded on the facility's computers, I brought my own laptop to this workshop so I could toggle between my PowerPoint slides and my laptop's on-board video camera to project the participants' drawings (purely voluntary of course) on the screen for everyone to see. The comic on screen there is actually one I drew as I worked through the exercises with them. I'll dissect that comic in my next blog post. I ran out of the 40 little packets I'd made up for workshop participants, so I'd guess I had about four dozen people in a small classroom. Standing room only! I've done variations of this workshop a few times, and how it goes really depends on how willing the participants are to dig in and share their work, which I acknowledge takes guts to do. These guys were tremendous. They made some excellent short comics that really seemed to apply what I aimed to teach, and I hope/think everyone had a good time doing it. Immediately after my workshop, I moderated a panel of three presentations on the topic of "Private Lives, Public Health." Moderating is usually light duty: introduce everyone, keep them on time, give them a 1-minute warning when they're running out, field some questions. All went well until near the end of the first speaker's talk, when a booming Voice of God blasted from the auditorium's sound system. First thought: the speaker's presentation had an audio file embedded in it. No, she looked puzzled, too. Second thought: the computer had fritzed and begun playing some other file. Nope. As a few of us gathered around the podium and the voice continued to boom, we figured out we were picking up a wireless microphone from another auditorium and eavesdropping on someone else's lecture. We managed to kill the entire audio system but then couldn't get it back up, so the remaining two presenters had to orate the old-fashioned way. Luckily they were game, and good speakers. I still feel bad for the first. Nobody prepared me for that in moderator school. Also, the series "House of Cards" was evidently shooting scenes across the street from my hotel. Alas, no Kevin Spacey or Robin Wright (sigh) sightings from my window. The next day, my responsibilities were done and I could relax. I tried to take more photos. Continental breakfast in the cafe before starting the day. The other half of the cafe was a greenhouse where a silent auction was held for participants' artwork, mostly good-quality prints. I ate lunch with two of our keynote speakers: Carol Tilley from the University of Illinois Urbana-Champaign, who gave a great lecture on psychiatrist Frederick Wertham, who in the 1950s convinced the American people and Congress that comics were evil and almost destroyed the industry; and Arthur Frank, professor emeritus in Sociology from the University of Calgary, who is a scholar on illness memoir and gave a brilliant talk. I just met Carol at this conference but knew Art from a similar event at UC Riverside last year, where he gave a different but also brilliant talk. Fine dining. 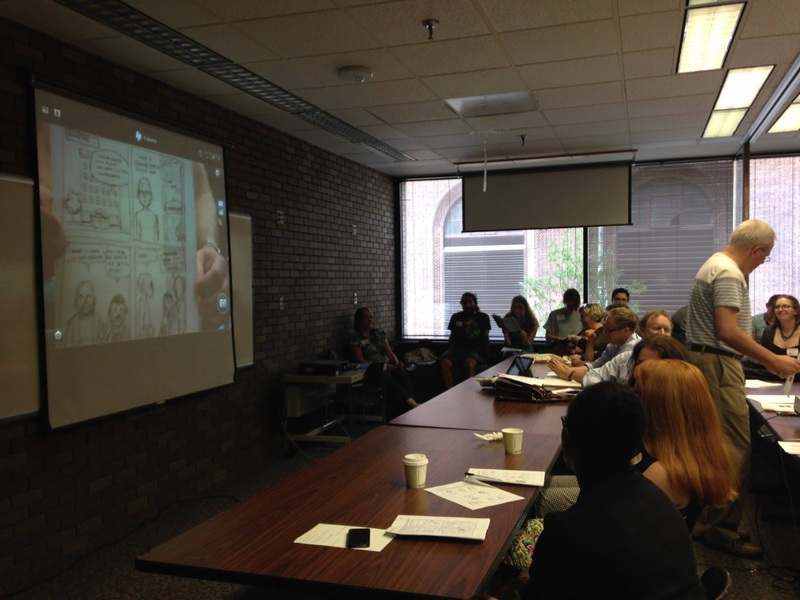 Here's an example of Graphic Medicine in action: Gary Ashwal and Dr. Alex Thomas created Booster Shot Comics to help teach sick kids about their diseases, including a comic book series titled "Iggy and the Inhalers" for children with asthma. During their presentation, they showed data that kids who'd read their comics had much greater understanding of their illness and treatment. I liked this presentation because I remember seeing Alex and Gary a few years ago when they were just getting going, and it's neat to see how much they've accomplished. As part of the same panel, Laura Ruth Venable and MK Czerwiec talked about creating a comic to help clinic patients in Chicago transition from one primary care provider to another. They had results showing that while patients tended to forget or ignore letters informing them of care changes, they paid more attention to and remembered comics conveying the same information. Group discussion at the end of the same panel (from left): Laura Ruth, MK, Gary, Alex, and Leah Eisenberg. Leah talked about developing comics to help gain children's informed consent for medical procedures. Following a keynote speech by Ellen Forney, the day and the conference were capped by a Marketplace similar to a comic convention dealers' room, where participants could sell their own books, prints, whatevers. Local comics shop Atomic Books was on hand to sell several related books, including Mom's Cancer. (Atomic Books also hosted a post-conference event Friday night, Laydeez Do Comics, which I didn't attend.) In addition to sales tables, a signing table was set up so Ellen, conference co-organizer Dr. Ian William, and I could sign our books. Also attending was artist David Lasky, whose book Don't Forget The Song (written by Frank Young) was put out by my publisher Abrams and won a 2013 Eisner Award. He was at the conference because he recently illustrated a comic on the 1918 flu pandemic for Seattle & King County Public Health that aims to inform the public on handling future epidemics or pandemics. We compared notes on our mutual editor Charlie Kochman. Look out, Charlie. A portion of the Marketplace. I think 18 or so people had tables in the relatively small cafe. There's some excellent work out there. Another portion of the Marketplace. Those people all facing left in front of the yellow wall are lined up to see . . .
. . . me! Well, also my friend Ian Williams, whose debut graphic novel The Bad Doctor is getting excellent reviews, and the conference's concluding keynoter Ellen Forney, author of the NY Times Bestseller Marbles: Mania, Depression, Michelangelo, and Me. I think Atomic Comics sold out of all of our books. My friend Mita Mahato, professor of English at the University of Puget Sound, and I being expertly photobombed by MK Czerwiec. Mita led a fun workshop on making and binding zines--small homemade comics whose handcrafted quality is a big part of the appeal. She does beautiful paper cutout work that I like a lot. MK is short. Cartoonist Joe Sutliff attended because he did a comic for the Fairfax County (Virginia) Health Department on mosquitoes and ticks that's been adopted by other health agencies around the country. But I was especially happy to meet Joe because we both contributed drawings to the Team Cul de Sac book raising funds for Parkinson's Disease research. He totally made my day by pulling out his copy of the book and asking me to sign it. A couple of other people also made me very happy by saying nice things about Whatever Happened to the World of Tomorrow, which I wouldn't expect anyone in this context to know or care about. Very cool. Dan Bustillos is an assistant professor of Healthcare Ethics at St. Louis University, whose class I recently spoke to via Skype but had never met in person. Good guy with a great fashion sense. I had a couple of opportunities to place faces to people I'd only known as e-mail or Web presences, which is always fun. With the bad doctor, Ian Williams. Sorry, I meant The Bad Doctor. Italics change everything. Eating Afghan with Art Frank. There were a lot of neat people in Baltimore, including some friends, that I didn't happen to get photos of. Michael Green, Susan Squier, Shelley Wall. If I start listing them, I won't be able to stop. However, I need to mention three: Lydia Gregg, a medical illustrator at Johns Hopkins, did an excellent job of organizing the conference, which unwound with clockwork discipline (but in a nice way). She worked very hard and pulled it off. Also, I was very happy to see Juliet McMullin from UC Riverside, who organized the conference I spoke at last year, in Baltimore with her daughter Sheila, with whom I had a very nice conversation over dinner Saturday. We have a joke in my family that I head off to each Comics & Medicine Conference swearing that it's going to be my last one, and coming home too excited to wait for the next one. It's not my place to make any announcements, but it looks like next year's conference could be relatively close to home; if so, I think I kinda need to be there. These are my people. Instead, I woke up thinking about the best bad rhymes in songs: lyrics that scan so poorly they're almost admirable in their audacity. These are a few I came up with. Feel free to add your own. 4. "Wreck of the Edmund Fitzgerald," Gordon Lightfoot. With a crew and good captain well-seasoned. Get that ship and crew outta Nevada. Ignoring the egregious "Texas" and "facts is" for a moment, that second line is more padded than a fifth grader's essay when he's 40 words shy of 100. Remember, I should be working right now. "Shoulder?" It works better than you'd expect because it mirrors a "shoulder" and "colder" pair earlier in the song. But what I love about it in this verse, where it doesn't rhyme at all, is the story that goes with it. As I heard it, Paul was writing the song and threw in that last line as a placeholder. "I'll tidy that up later," he thought in his adorable Liverpool accent. But John heard it and said "That's perfect!" Paul shrugged and left it. What makes this bad rhyme one of the best is that The Beatles were so huge and confident that they just didn't have to give a flyin' fig anymore. 1. "Ode to Joy," Beethoven's Ninth Symphony; music by Ludwig van Beethoven, lyrics by Friedrich Schiller. "Elysium" and "Heiligtum" both have three syllables and end with an "um." That's it. Might as well have gone with "radium." If "Ode to Joy" had been done by Herman's Hermits, I'd let it pass (though note that "Henry the Eighth" rhymes excellently throughout, as long as "Hen-er-y" has three syllables). But Ludwig, Fred . . . guys . . . you're supposed to be better than that. Now what else can I do besides work? Tomorrow night I'm catching a red-eye flight from San Francisco to Baltimore (via Chicago) for the Fifth Annual International Comics & Medicine Conference. I attended the first, helped organize the second and third, and missed the fourth. Now it's off to Johns Hopkins to reunite with old friends and, I'm sure, make a few new ones. These conferences are terrific! Here's a link to some posts about my previous trips to London, Chicago and Toronto, plus another conference organized by a different group last year in Riverside, Calif. Doctors, nurses, professors, students, and cartoonists get together and actually have a lot to talk about--using comics to tell patients' stories, caregivers' stories, medical professionals' stories . . . convey public health information . . . relate experiences in ways other media can't. "Graphic medicine" is a small niche of comics and a small niche of medicine, but it's getting more attention in both realms, including articles in prestigious medical journals. It's been extraordinarily gratifying to be in on the ground floor of it. I'm scheduled to give a 5-minute "lightning talk" on "Ten Years of Mom's Cancer," then a 90-minute hands-on workshop titled "See One, Do One, Teach One" to show people how to make comics. I'll also be moderating one panel discussion because nobody better was available. Looking forward to the conference; not looking forward to the flight. Lots of photos and probably a couple of stories when I get back. Bust out your red and blue 3-D specs. (If you're one of the 50 people who bought my limited-edition zine a couple of years ago, you already have a pair!). Sometime in the past couple of days, some Facebook friend of mine posted something about World War I. That's about as specific as I can be. Facebook ephemera flits, floats, and quickly fades. But this one stuck a little because it reminded me of something I've meant to try. I've mentioned before that I collect stereocards. They're basically Victorian Viewmasters, popular in parlors around the turn of the last century. 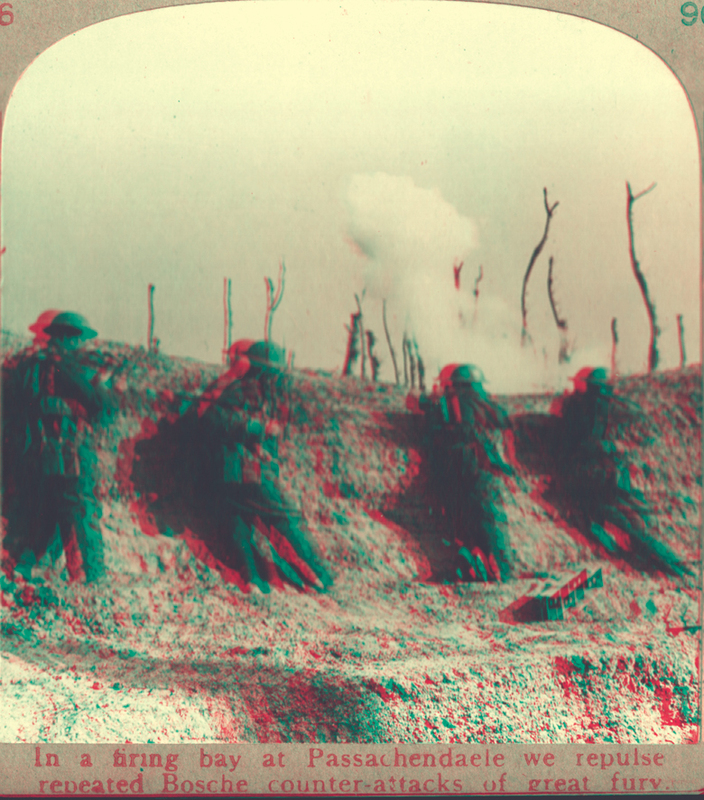 Two photos shot simultaneously a few inches apart from each other are mounted on a heavy card and viewed through a stereoscope, which merges the images into a 3-D scene. It's easy to understand why these were so popular. They were often published in series with a theme: world travel, religious tableau, slice of life, natural wonders. Stereocards offered a startling "you are there" experience for people who'd never have a chance to see such sights in real life. 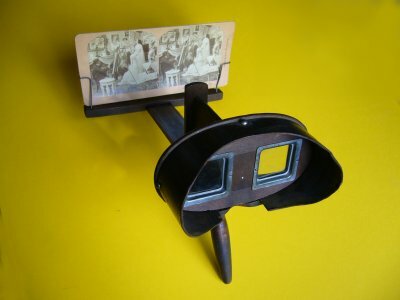 A stereoscope with a stereocard loaded for viewing. This isn't mine, but looks a lot like it. It's an affordable hobby. Stereocards are common, and are typically found in antiques stores for a few bucks each, depending on quality. The most I've paid for one is $20, but it was exceptional. I'm sure that in 1900 a well-appointed parlor could have hundreds of cards. I've got a few dozen. 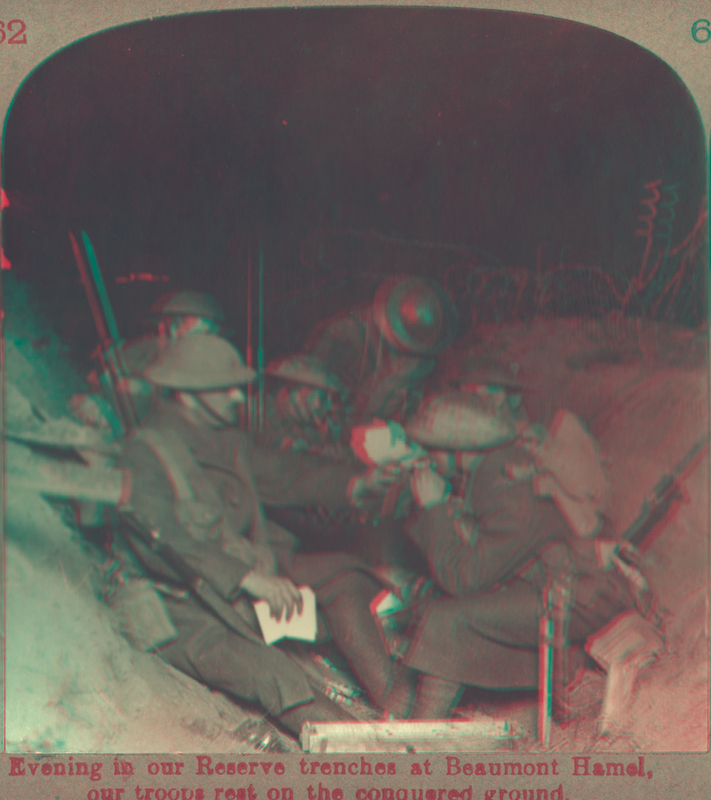 Pulling today's themes together: what I've wanted to try, and my friend's Facebook post prodded me to do, is convert some old stereocards so their images could be viewed with modern red-blue 3-D glasses. It's easy in theory: since the photos are already black and white, just use Photoshop to convert the left eye into the proper blue color, the right eye into the proper red color, and overlap them. Turns out it's pretty easy in practice, as well! 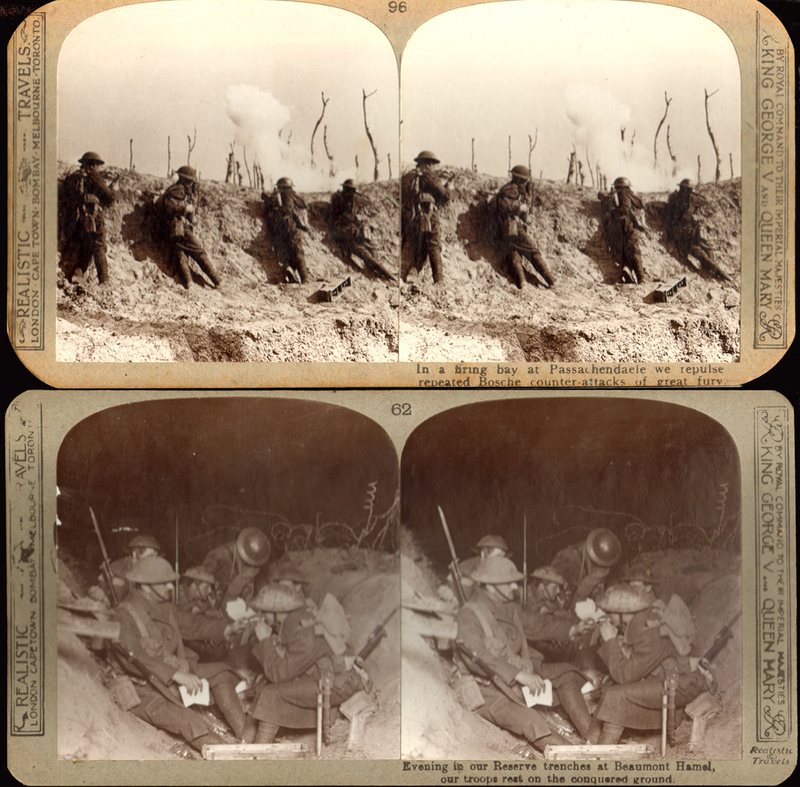 Here are two of my stereocards shot in the trenches of World War I.
BTW, the bottom one is the one I paid $20 for. I give it free to you. I'm moderately happy with the results. I think some detail is lost in converting the images to red and blue, especially in dim areas. In person, these views really pop! But I'm calling this experiment a success. I've got a lot of these cards. Maybe when I get a little time, I'll convert some more of my favorites. When I started my "Last Mechanical Monster" webcomic late last year, I described how this story emerged from a different story with the same characters that I'd been working on for a couple of years. 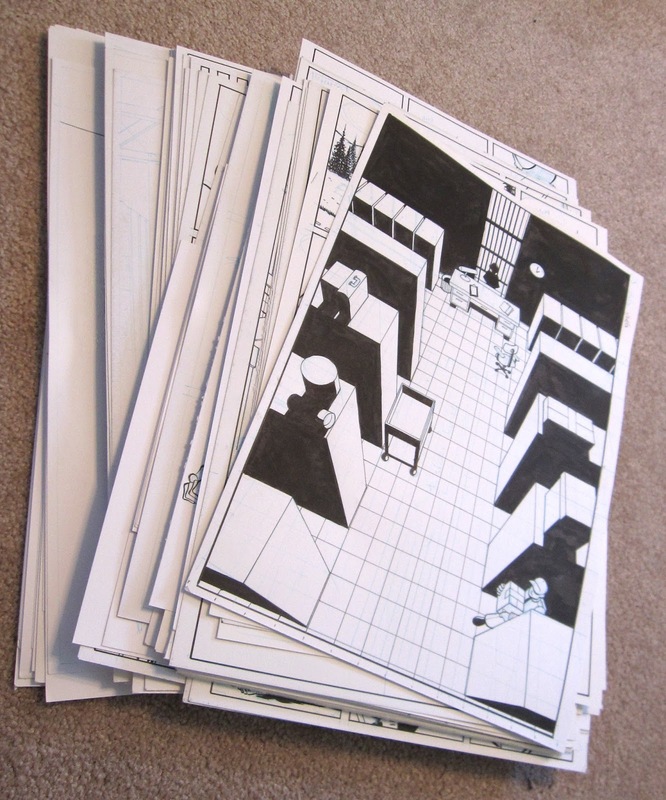 In 2012 I began penciling the pages of that earlier version and drew more than 100 pages before realizing, a year later, that it wasn't really the story I wanted to tell. How hard was it to develop a story for two-plus years, draw 100 pages of it, screech to a halt, turn on a dime, and start over in an entirely different direction? Surprisingly easy. I loved the new idea--the webcomic I hope you're reading now--and what had become a tough boring slog through characters and plot points I didn't enjoy turned into an exciting fresh reset. The project went from work to fun, and has mostly stayed fun since. I'd penciled the original story on sheets of 2-ply Bristol board, a heavy paper with a little texture that takes ink well. It's also not cheap. Faced with the prospect of starting over from scratch, I grabbed a page from the old story's stack, turned it over, and drew Page 1 of the new-and-improved story on its blank side. Verso became recto, and I created Version 2.0 literally on the back of Version 1.0. Now, more than a year after I began, I've just about run out of paper. That's a milestone for me! Not only have I surpassed my effort on V1.0, I've basically doubled it, since this time I'm both penciling and inking the pages as I go. My original V1.0 scheme was to write the entire story first, then pencil the entire story, then ink the entire story. It seemed like a good idea at the time. I thought that process would help me maintain a consistent art style throughout, and give me some flexibility to change the story as I went. For example, if I thought of a great bit while working on Page 100 that required something to be set up on Page 20, I could go back and do that in the script or pencils without wasting time and ink. In practice, it was difficult and boring to do nothing but writing, then nothing but penciling, for months on end. I was already dreading the upcoming months of nothing but inking. I needed variety. It seemed like nothing ever got finished. Around the same time, I'd begun posting my "Adventures of Old Time-Traveling Brian" comics as a lark; it was so liberating to conceive, write, pencil, ink and post a short story in a single day that I yearned to bring some of that same energy to my long-form comics. Consequently, for V2.0 I switched up my process so that I now work in small batches of pages, seeing them through essentially to completion. I have an outline for the entire story--I know where it's going and how to get there--but the actual dialog and action for individual pages is written spontaneously. I write, pencil, ink, post. Since I'm a couple of months ahead of deadline, I have time to reflect and revise. Also, because "The Last Mechanical Monster" is a webcomic, I still have some freedom to go back and change past pages to accommodate new ideas. This process wouldn't work for everyone but it's good for me. Now I'm off to the art supply store. Blogging may be sparse as I pound through a busy summer. 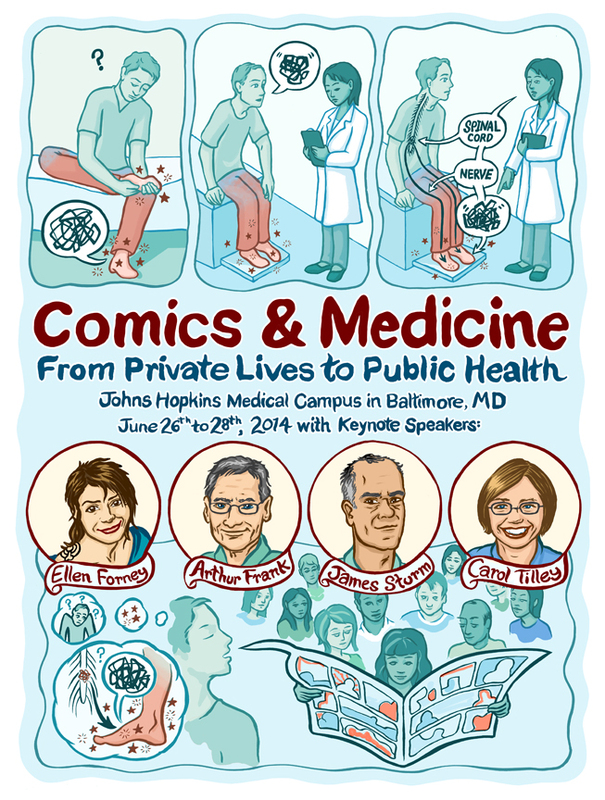 June 26-28 I'll be at a Comics & Medicine Conference in Baltimore. I'm doing a five-minute "lightning" talk, teaching a 90-minute workshop, and moderating one panel. I'm very much looking forward to reconnecting with friends I've made in London, Chicago, Toronto, Riverside and elsewhere, and meeting new ones as well. July 24-25 I'll be at Comic-Con International in San Diego. I won't be moored to a table or booth. If anyone really wants to find me, I'd suggest leaving a note at the Abrams booth, where I'll be sure to check in from time to time, or hunting me down at the Eisner Awards Friday night. If you want to catch me in a good mood, find me before the Best Webcomic Award is announced. I've also volunteered to do one hour of commission drawing to support the Cartoon Art Museum in San Francisco, but don't know for sure if or when that'll happen. I'm leaving Comic-Con very early Saturday, July 26, to get back to the Bay Area in time for Splashdown, the USS Hornet's celebration of the 45th Anniversary of Apollo 11. My six long-time readers know that my daughter Laura is on the Hornet Museum's staff, and I'm actually scheduled to give a talk on the big hangar deck's main stage. Details and themes to come, but think "Whatever Happened to the World of Tomorrow?" An hour after I speak, Buzz Aldrin will stand at the same podium to blah blah Second Man on the Moon blah blah blah. I only hope my screaming groupies don't distract from his remarks. I put a lot of time and effort into preparing for these things, then even more time and effort into looking like I didn't prepare for them. If you've ever seen me give a talk and thought I stunk, I assure you it wasn't for lack of time and effort. Ah, June: the month that my wife and two sisters all have birthdays within seven days of each other. Or as I call it, "Hell Week."